Tour Scotland Red Castle Lunan. 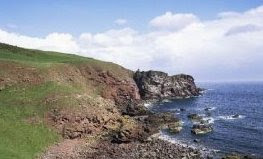 Red Castle of Lunan is a ruined fortified house on the coast of Angus, Scotland. It is about four miles south-southwest of Montrose. Tour Scotland Torphichen Preceptory. Torphichen Preceptory, is a church in the village of Torphichen, West Lothian, Scotland. It comprises the remains of the Preceptory, headquarters, of the Knights Hospitaller of the Order of St John of Jerusalem in Scotland. Tour Torphichen Preceptory. Tour Scotland Pluscarden Abbey. 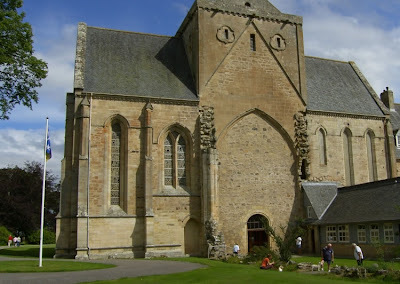 Pluscarden Abbey is a Roman Catholic Benedictine monastery located in the glen of the Black Burn about eight miles south-west of Elgin, in Moray, Scotland. It has been for most of its history a priory and was founded in 1230 by Alexander III of Scotland for the Valliscaulian Order. Tour Scotland Wormit Beach. 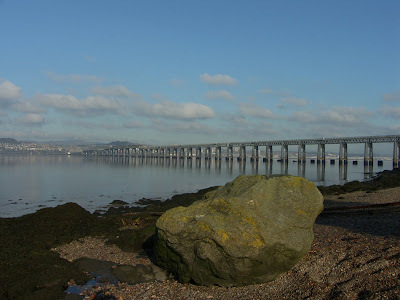 A good location to view the Tay Railway Bridge and the City of Dundee. Tour Scotland Forth Estuary January. A rather dull day today all over Scotland. Shot this photograph just east of the Forth Railway Bridge. 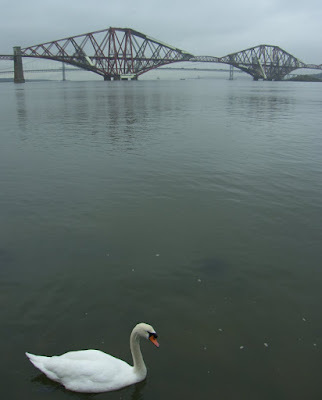 A swan in the Forth Estuary. Tour Scotland Lower Luthrie, Fife, Scotland. 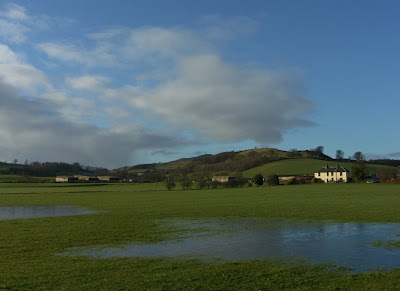 Bright sunshine today, but as you can see there has been a lot of rain in this area of Scotland. Tour Scotland St Andrews Panorama. St Andrews is a city and former royal burgh on the east coast of Fife, Scotland. It is named after Saint Andrew the Apostle. It is home to Scotland's oldest university, the University of St Andrews. From mediaeval times until the Reformation, St Andrews was the ecclesiastical capital of Scotland: its bishop being the primus of the Scottish church. Today, St Andrews Castle and St Andrews Cathedral lie in ruins. The town of St Andrews is known worldwide as the "home of golf". Tour Scotland Anstruther January. Spent this morning in the village in which I was raised in Scotland. Very cold and windy, but quite sunny. As always, there were boats going to and from the harbour, the largest of the East Neuk of Fife ports. Tour Scotland Braan. A January 2009 view of the River Braan. The River Braan is a tributary of the River Tay in Perthshire, Scotland. It flows eleven miles eastwards from Loch Freuchie, near Amulree, and joins the River Tay near Dunkeld. Tour Scotland Mysterious Glasgow. 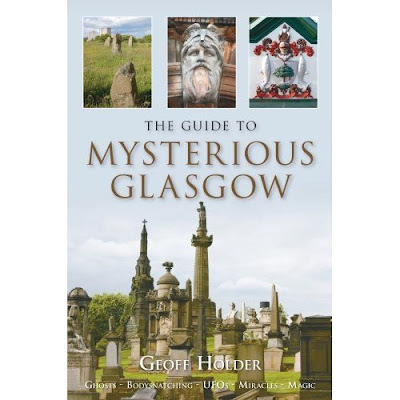 Hundreds of first-hand and archive accounts of paranormal activity and includes hidden treasures and mysterious sights from all across the city of Glasgow. Tour Mysterious Glasgow. Tour Scotland Burns Verse. For those of you wishing to practice your Scots, which is the indigenous language of Lowland Scotland, before you attend a Burns Supper. When upward-springing, blithe, to greet. Cauld blew the bitter biting north. Yet cheerfully thou glinted forth. Scarce reared above the parent earth. But thou, beneath the random bield. Thou lifts thy unassuming head. Sweet floweret of the rural shade! Till she, like thee, all soiled, is laid. Unskilful he to note the card. By human pride or cunning driven. Till crushed beneath the furrow's weight. Tour Scotland Sheriffmuir Winter Drive. Took a drive today over Sheriffmuir, near Dunblane, Scotland. A desolate moor on a northern slope of the Ochil Hills. It was the scene of the Battle of Sheriffmuir, an indecisive confrontation in 1715 between the Jacobites under the Earl of Mar and the Hanoverians led by the Duke of Argyll. Robert Burns, the National Bard of Scotland, wrote a poem about this battle. Tour Scotland Telephone Box. Quite a bit of snow today in Scotland. 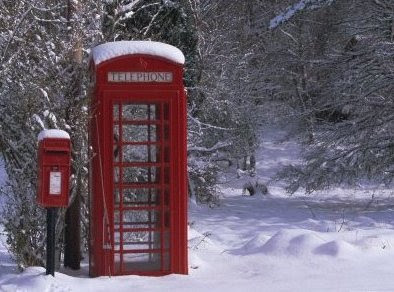 A Red Letterbox and Telephone Box in the Snow, Highlands of Scotland. Red Letterbox and Telephone Box in the Snow, Highlands, Scotland, UK, Europe Photographic Poster Print by David Tipling, 32x24 . Tour Scotland at a windy Dundee Viewpoint. At a height of over five hundred feet above sea level, Dundee Law provides a popular, easily accessed vantage point placed high above the centre of Dundee, the fourth largest city in Scotland. Across the Firth of Tay can be seen the Kingdom of Fife. In Scotland, the word Law often means Hill, as it does when referring to Dundee Law. Tour Scotland Tam O'Shanter. Storyteller Donald Smith introduces Burns' famous Tam O'Shanter, and artist, actor and puppeteer Ian Turbitt unfolds a new take on Tam. Witty character acting and energetic storytelling theatre combine with handmade puppets and props for a dazzling tribute to Burns' well-loved poem. Wednesday, 21st January, 7.30pm (60mins), £6/£4 at the Scottish Storytelling Centre. This show will appeal to adults and older children (over 12s) and is a fresh approach to Burns which will appeal to all, whether you are new to Burns or know his poems by heart! Biography of Robert Burns, The National Bard of Scotland. Tour Scotland Linlithgow. 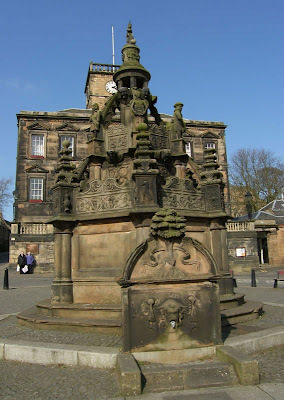 Linlithgow is a town and former Royal Burgh in West Lothian, Scotland. Tour Linlithgow. Tour Scotland Burns for Bairns. Hi Sandy, We thought that you and your guests would like to hear about a brilliant Robert Burns show for bairns from eight to ninety eight! Oor Rabbie by Foolish Notion is part of the Scottish Storytelling Centre’s Burnsfest, celebrating 250 years of Burns, and part of Homecoming Scotland. Scottish Storytelling Centre, Edinburgh. Join Foolish Notion for the perfect introduction, or refresher, to the life and work of Robert Burns. With live music and witty storytelling theatre, discover the history of Scotland's famous bard through his best-known work, including Tam O'Shanter, Tae a Mouse, Tae a Louse and Address to a Haggis. Foolish Notion is Wendy Weatherby, cello, and Andy Cannon, Wee Stories Theatre, one of Scotland's most acclaimed folk musicians and one of Scotland's most acclaimed storytellers working together to create a unique theatrical experience. Fri 23rd Jan, 7pm. Sat 24th Jan, 3pm. Sat 24th Jan, 7pm. Fri 30th Jan, 7pm. Sat 31st Jan, 7pm. Tickets 8 / 6 children and concessions. Family ticket (4 people) 24. Ages 8+. Box Office 0131 556 9579. Scottish Storytelling Centre, 43-45 High Street, Edinburgh EH1 1SR. Tour Scotland Lundin Links Stones. Lundin Links Standing Stones, East Neuk of Fife, Scotland. The Standing Stones are a scheduled Bronze Age ancient monument dating from 2000 to 1500 BC. The stones are of national importance and a highly visible example of an early prehistoric ritual site. The stones are located on the third fairway of the Lundin Ladies Golf Course. Tour Lundin Links. Lundin Links Stones Photographs. Tour Scotland Musselburgh. Musselburgh is located in East Lothian, on the coast of the Firth of Forth, Scotland. Tour Musselburgh. Tour Scotland Eyemouth. Eyemouth is a small fishing port and parish in old Berwickshire, in the Scottish Borders. Tour Eyemouth. Tour Scotland Dunbar. 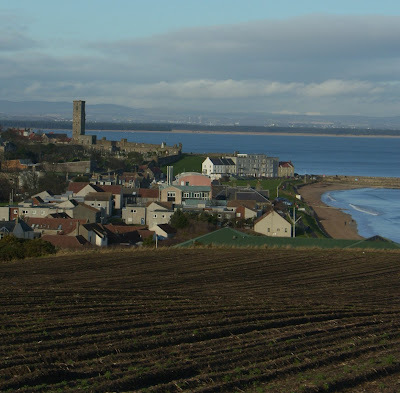 Dunbar is a town in East Lothian on the southeast coast of Scotland, thirty miles east of Edinburgh and almost the same from the English Border at Berwick-upon-Tweed. Robert Burns Scottish National Poet Portrait. 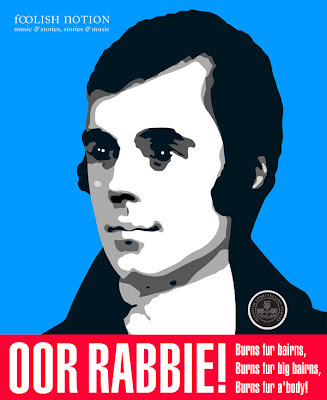 Robert Burns Scottish National Poet Portrait Collections Giclee Poster Print, 9x12 . Robert Burns, 1759 to 1796, was known as the Bard. He is Scotland's most famous poet. Robert Burns wrote in the Scottish language as well as in English. 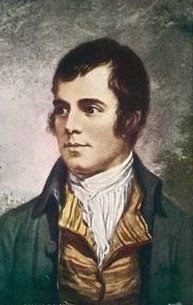 Robert Burns, from Ayrshire, was a leader in the Romantic movement and after his death he was an inspiration to the liberalism and socialism movements. 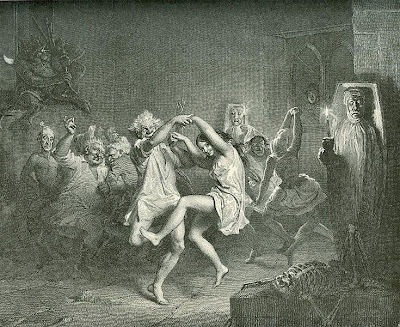 Auld Lang Syne was written by Burns. Burns used his knowledge of classical, Biblical and English literature to draw inspiration for his poetry. Includes letters Burns wrote to many different people. The epistles provide an in depth look into the personality of a truly great man. The Works of Robert Burns . Burns Supper Companion. Every instruction you need to enjoy or arrange a Burns Supper just add food, drink and friends. Robert Burns is Scotland's second greatest gift to civilization, after whisky, and his poetry is rightly celebrated across the globe. The odds are you will be invited to a Burns Supper Night at some point in your life, probably in late January, and you may even want to host a Supper of your own. Whatever the case, this book will provide you with all the information you need to make sure your Burns Supper is a great event enjoyed by all. This is the Ultimate Guide to the Burns Supper. Containing all the information you need to enjoy a Supper, whether as host, speaker or guest, this book is full of advice, anecdotes, poetry and wit. Contains: A complete run through of what to expect on the night, with a list of courses and speeches; Advice on what to wear; A section on how to prepare and present speeches; A list of common Burns Supper questions, and their answers! ; A selection of Robert Burns greatest poems, including a full English verse translation of the Address to a Haggis. The Ultimate Burns Supper Book: A Practical (But Irreverent) Guide to Scotland's Greatest Celebration . Eddi Reader Sings the Songs of Robert Burns. 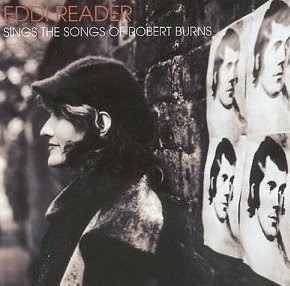 Eddi Reader Sings the Songs of Robert Burns . 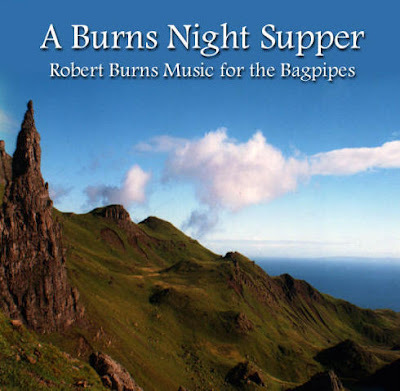 Music For A Burns Night Supper. A Burns Nights Supper . 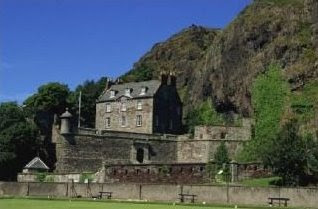 Tour Scotland, Small Group Tours of Scotland, Ancestry Tours of Scotland, Tour Scotland Photographs, Biography of Robert Burns, Burns Supper Menu, Robert Burns The Patriot Bard, Robert Burns Flesh and Blood, The Bard Of Scotland, Tour Scotland. Tour Scotland. A January Sunrise drive through rural Scotland today. Nine O'Clock on a cold Scottish winter morning with icy roads and an incredible Red Sky in The Morning. Tour Scotland Helensburgh. 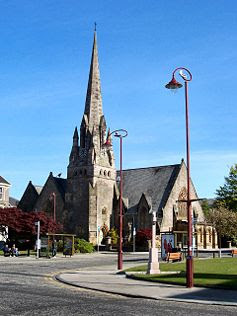 Helensburgh is a town and former burgh in Argyll and Bute, Scotland. It lies on the north shore of the Firth of Clyde. Tour Scotland Dumbarton. Dumbarton, is the chief town of the county of Dumbarton, is located near the confluence of the River Leven with the River Clyde. Tour Dumbarton. Tour Scotland Fairy Glen. Ice in the Shee Water and snow on the mountain tops today in the Fairy Glen. Tour Scotland Stepping Stones. Anstruther Stepping Stones, East Neuk of Fife, Scotland. A series of stepping stones permits crossing of the Dreel Burn to Castle Street beach which leads you onto Shore Street Anstruther, provided the tide is not too high. 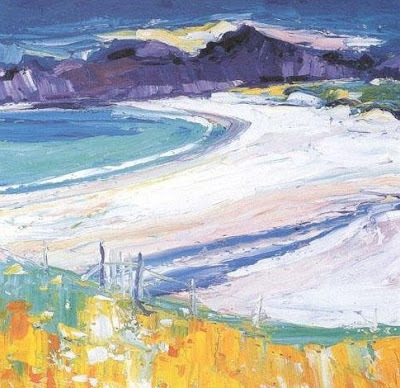 Tour Scotland Colonsay. Colonsay is an island in the Inner Hebrides of Scotland, located north of Islay and south of Mull. Colonsay is the ancestral home of Clan Macfie and the Colonsay branch of Clan MacNeill. Tour Colonsay. Tour Scotland Cairnwell Pass. A drive along the road to Glenshee Ski Centre which is located on either side of the Cairnwell Pass, the highest road in the United Kingdom, five miles north of the Spittal of Glenshee. Tour Scotland River Tay Reed Beds. These reed beds in the River Tay by Newburgh are said to be amongst the largest in Europe. Tour Scotland New Year's Day. New Years Day in Perth Scotland. A quiet, and cold, New Year's morning beside the River Tay in Perth, Scotland. The first day of January 2009.